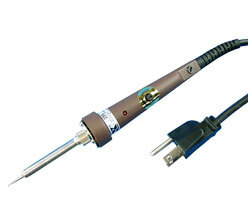 Plug & Play, 20Watt soldering iron with nichrome heating element.Preloaded standard tip included. 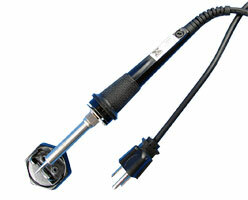 Plug & Play, 25Watt soldering iron with nichrome heating element.Pre-loaded standard tip included. Plug & Play, 30Watt soldering iron with nichrome heating element. Pre-loaded standard tip included. Plug & Play 25Watt Soldering iron. U.L. Listed and 3 Wire Grounded, Heavy Duty. Pre-loaded conical tip included. Plug & Play 40 Watt Soldering Iron. U.L. Listed and 3 Wire Grounded, Heavy Duty. Pre-loaded standard tip included. Plug & Play 60 Watt Soldering Iron. U.L. Listed and 3 Wire Grounded, Heavy Duty. Pre-loaded standard tip included. Plug & Play 70Watt SMD EZ Tweezer. Pre-loaded standard tweezer tips included. 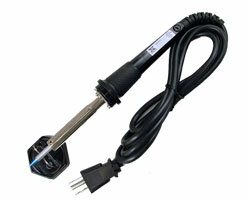 Plug & Play 16-30W Variable temp soldering iron. Pre-loaded standard tip included.